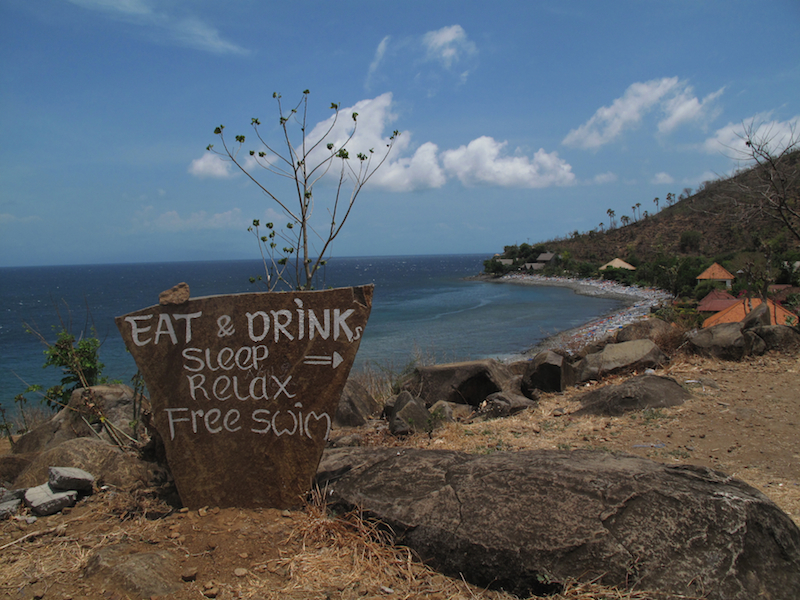 Famed for its pristine reefs, Amed lures divers from around the world, but there is much more to this scenic coast line than ship wrecks and coral gardens. Tucked into the north east corner of Bali, where rugged mountains tumble to a cerulean sea, Amed basks in glorious isolation. Peaceful fishing villages cling to the coast where black sand is lined with colourful jukungs (fishing boats) and tranquil bays teem with marine life. Often described as sleepy, the region is gently waking up and provides a quirky, unspoilt alternative to the buzzing south. Amidst the rustic home stays and charming boutique hotels traditional life continues much as it always has. Fishermen set sail before dawn, farmers tend to cassava and peanut crops, and the white crystals of the salt pans glisten in the sunlight. Amed’s attractions are not limited to single sites, you need to take in the big picture by immersing yourself in the dramatic natural scenery as you explore the ocean and the land. The name Amed generally refers to a string of fishing villages joined by a narrow road that dips and winds between the mountains and the sea. Each upward swerve reveals picturesque half moon bays that will have you constantly reaching for your camera. This is the driest region of Bali and the sloping, parched red earth is strewn with boulders, brambles, black lava rock and wild grasses baked to a crisp coppery gold. In striking contrast, branches of bougainvillea, hibiscus and frangipani frame the deep blue sea with vibrant splashes of colour. Low lying villages are set amidst palm groves and mango trees, where women collect firewood, chickens streak across the road in wild abandon and cows loiter in the shade of the banana groves. A scenic road leads inland to the village of Bangle and gives a glimpse into rural life, with terraced hills strewn with cassava and corn plantations and houses made of stone and thatch. The village nestles in an oasis of greenery, thanks to a series of holy springs – each with a different taste. For a small fee one of the villagers will act as a guide. Past Bangle, the rough road steepens sharply and leads to one of the island’s most important temples, Pura Lempuyang, known as the abode of the God Iswara, ‘keeper of the peace.’ Isolated on a windy mountain ridge with stunning views over the valleys, this mysterious and beautiful temple is a place of pilgrimage and spiritual awakening, especially during elaborate full moon ceremonies. The temple is more easily and safely reached on the inland road from Culik, and with 1700 steps to climb is best visited early in the morning. The Lombok Straight brings clean cold fast moving water from the north which mixes with the warm Bali tropical water to create a unique artisan salt which is stocked in gourmet delicatessens around the world. While the industry is declining, salt pans are still scattered around the shores of Amed, where farmers use ancient techniques to craft 100% natural salt by sun and wind evaporation. 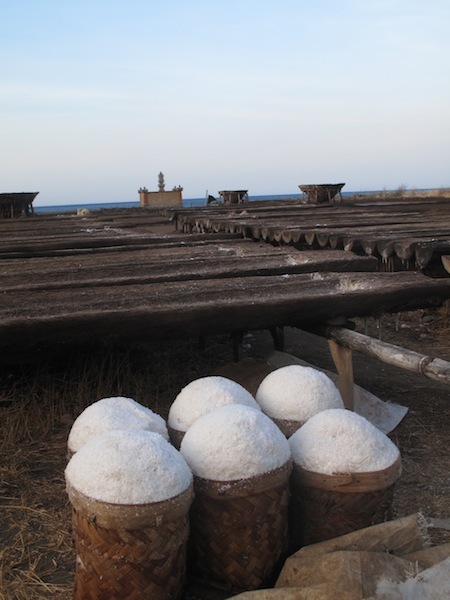 The taste is unique – mild and slightly sweet – and salt can be bought direct from the farmers who will happily give you a tour and explain the production process. In total contrast to the inhospitable landscape, the calm sea is home to some of Bali’s most beautiful reefs – a veritable underwater fantasy world inhabited by frolicking sea horses, giant trevally, schools of barracuda, clown frog fish, reef sharks, turtles and a diverse range of hard and soft coral. The thriving marine life is attributed to low level tourism, and the phenomenon known as the Indonesian Through flow which links the Indian and Pacific oceans with streams of nutrient rich cold water that nourish the reefs of eastern Bali. The Liberty ship wreck in nearby Tulamben is one of Bali’s most famous dive sites, but the bays around Amed have plenty to captivate novice and experienced divers. Best of all, many of the sites can be accessed directly from the beach and are equally enjoyed with a mask and snorkel. Highlights include the sheltered bay at Jemeluk with a vibrant reef teeming with tropical fish just meters off shore, while a short swim or boat ride to the rocky point, known as the drop off, reveals slopes covered in giant gorgonian fans and red barrel sponge corals. Further east, the Japanese wreck at Banyuning nestles on a pretty coral garden; divers can explore the lower reaches, while snorkelers also enjoy great views of the wreck covered in sea fans and soft pastel corals swaying in the gentle current. There is a whole lot more to free-diving than just holding your breath. Once the bastion of pearl divers and extreme adrenalin junkies seeking to go ever deeper, these days people are more drawn by the opportunity to explore the silence and the beauty of the underwater world in complete freedom. Jemeluk Bay has become a centre for free-diving in Bali and is home to the island’s first free-dive school Apneista , www.apneista.com which offers two day courses combining advanced breathing techniques with yoga and pranayama. Sometimes described as ocean yoga or underwater meditation, the free-diver is unencumbered by a scuba tank and can glide through the water like a fish. Moving slowly and gracefully, without a trail of bubbles, allows a far more intimate and natural experience with marine life. Just being in Amed induces a state of peace and well being. Early nights are for floating to sleep lulled by the gentle murmur of the ocean; mornings are for rolling out of bed and straight into the sea; lazy afternoons call for languid lunches, siestas, relaxing beach massages, or a spa visit. Usher in the evening with a sunset yoga class at Apneista, overlooking the beach, or check for workshops in the hillside yogashala at Om Shanti www.omshanti.com A full range of detox and healing programs are offered at the luxurious Golden Rock Detox Centre www.theretreatbali.com while Aiona Garden of Health www.aionabali.com offers personalised ayurvedic programs, and sells herbal teas, kombucha, homemade jams and chutneys in a delightfully quirky setting. Amed makes a great base for climbing Moung Agung – best attempted in the dry season, and for visiting Tirta Ganga, an evocative water palace set in a maze of tropical water gardens filled with statues and stone fountains. Cycling is a great way to explore the countryside, and East Bali Bike tours www.eastbalibike.com have a range of options including tours from the slopes of Mount Agung down to the sea. A tranquil beachside haven with cottages, beach houses and pools nestled in enchanted gardens flourishing with frangipani and bougainvillea. 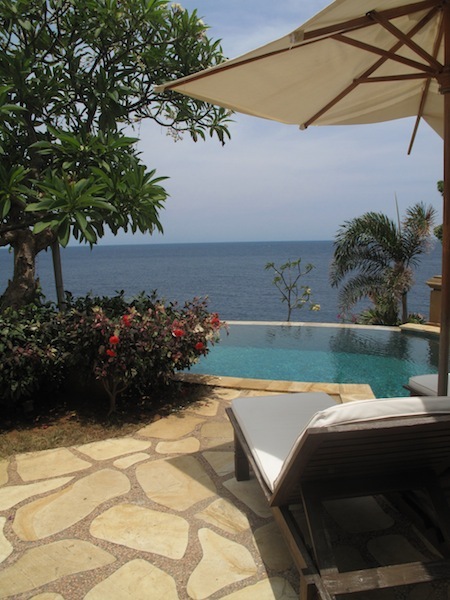 The atmospheric Perfumed Garden villa is highly recommended, with its wonderful antiques, ocean views and private salt water pool. With a fabulous garden setting on a headland overlooking Selang Bay these stylish suites and villas enjoy panoramic ocean views. Request one of the beautiful Blue Angel Oceanfront rooms and relax in the private infinity pool clinging to the cliff’s edge. Set in the shade of towering banyan trees and vibrant flowers these bamboo beach shacks are basic but charming, and just meters from the sea. 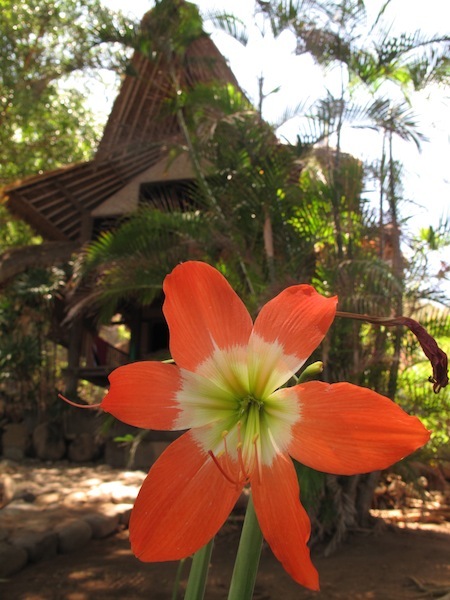 A rustic, eco friendly resort that is partly solar powered. The sprawling beachfront property aims to preserve salt production in the region and is built around salt pans. 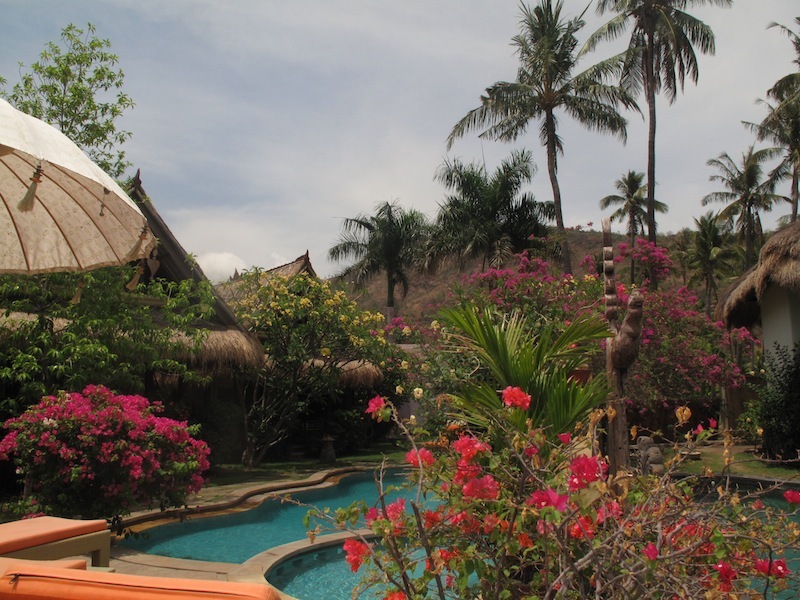 Local style warungs and home stays offer traditional food, while resorts and hotels have adjoining restaurants serving Indonesian and western cuisine. Top picks include Warung Enak a crowd favourite with tasty home style cooking made from fresh organic produce – the health juice with turmeric, lemon and honey is excellent. Komang John’s Cafe (Blue Moon Villas) has expansive ocean views and serves up authentic Balinese and international dishes, with a good selection of daily specials and tropical cocktails. Life in Amed offers fantastic salads, Indonesian and western food and the best chocolate cake in the area. The drive from the airport takes about three hours. Follow the road to Candi Dasa then turn inland to Amlapura passing tropical hinterland and verdant rice terraces. The small town of Culik in the shadow of Mount Agung marks the gateway to Amed. There is also a longer, more scenic coastal route from Amlapura, but the road is narrow and rough in places. 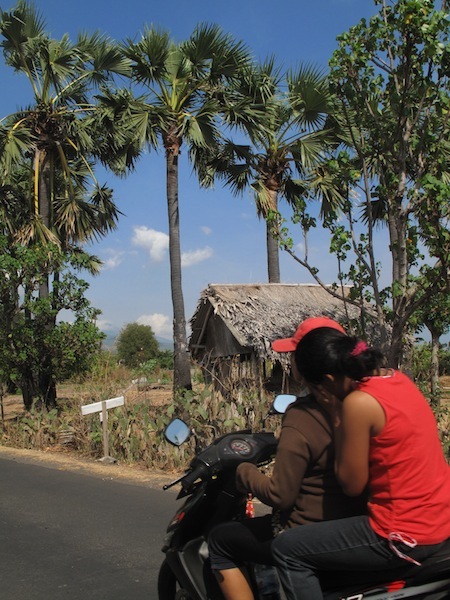 Public transport is limited, and there is much to see, so it is best to rent a car or motor bike.